We'd be surprised if you can guess which city finished No. 1 in our rankings. Last year, we surveyed 55places.com readers to find out what they wanted out of their retirement when it came to buying a home. When we asked how much they expected their next home to cost compared to the value of their current one, 26 percent said “about the same,” 27 percent said “slightly less” and 24 percent said “much less.” That’s 77 percent of active adult respondents telling us that their next home needs to be affordable. However, affordable doesn’t necessarily mean sacrifice. Those same readers are still looking for a fun and active retirement, whether it’s in a 55+ community or not. And there are plenty of places around the United States where you can strike a balance between affordable living, exciting amenities, healthy living, and peace of mind. For active adults on a budget, it’s not about finding the cheapest place to live. It’s about finding the place you can feel comfortable calling home. In September 55places.com ranked the 20 best places to retire in the U.S. This time, however, we wanted to focus on the towns, cities, and regions that foster that balance between affordability and good living. We looked at a series of factors and scores from reputable sources to create our rankings, all of which were weighted differently depending on their value. They include the overall cost of living, local home prices, state tax laws, well-being scores, availability of affordable 55+ communities, local health care options, public transit, and more (You can find our full methodology at the bottom of the post). While it’s ultimately up to you to figure out the ideal place for your retirement, we hope this ranking highlights interesting opportunities that you might not have considered and gives you the tools you need to make an informed decision. Here are the most affordable places to retire in the United States in 2019. 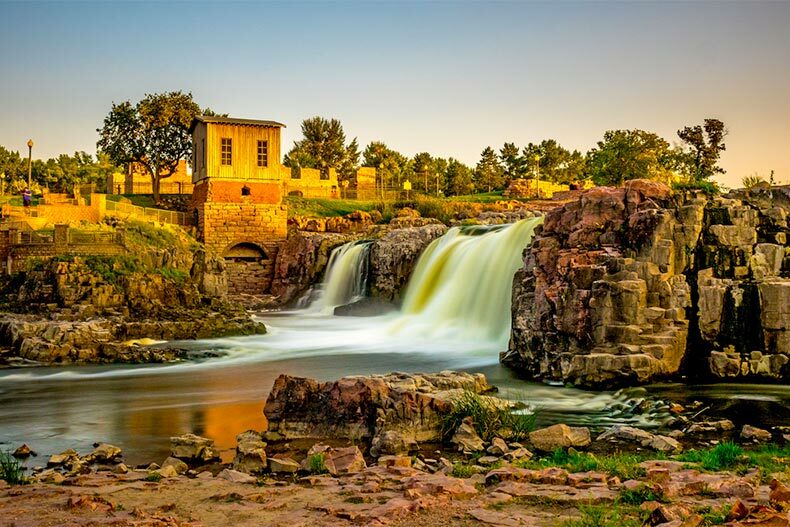 Sioux Falls, SD might sound like an unconventional retirement spot, but it comes with affordability, excellent health care, and a low cost of living. When it comes to retirement, we spend a lot of time talking about Florida, Arizona, and South Carolina. So imagine our surprise when we crunched the numbers and found the most affordable place to retire was located in...South Dakota. “The Best Little City in America” is also an ideal retirement destination for those who are looking to maximize their money in a city with plenty of things to do and experience. The city was at the top of our list in terms of resident well-being and scored extremely high in terms of affordable home prices and low cost of living, which is seven percent lower than the national average. The health care options here are also ideal, as Avera Health and Sanford Health are among the 25 largest nonprofit hospital systems in the country. Crime rates are well below national averages as well. And what really put it over the top was the fact that South Dakota’s tax rates are among the lowest in the country. The lack of a state income tax and no taxation on Social Security benefits means retirees can live large in this small city. You can’t go to Sioux Falls and not see its namesake. 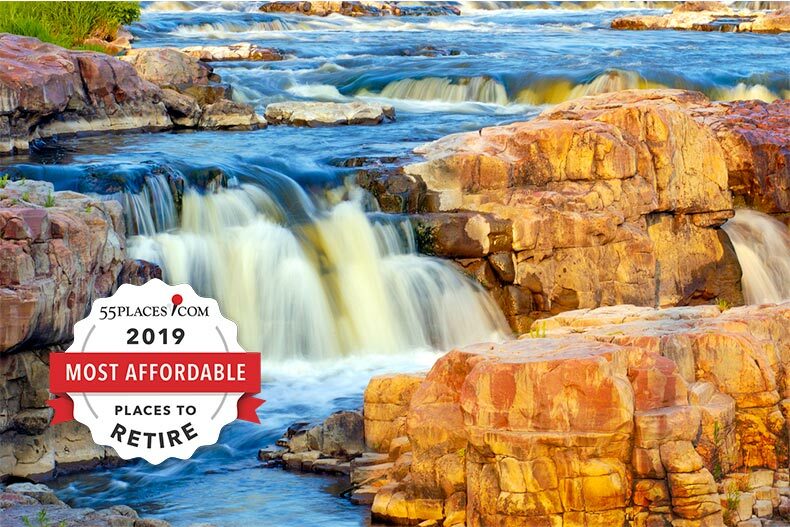 Experience the Falls of the Big Sioux River in the 123-acre Falls Park, where you’ll also be able to visit some of the city’s original and oldest structures. Or you can visit another one of the 80+ parks within the city or ride it’s 29 miles of bike trails. Then take a stroll through downtown to peruse the latest works of art along SculptureWalk Sioux Falls. Some other great stops include Washington Pavilion, Old Courthouse Museum, Great Plains Zoo and the Battleship USS South Dakota Memorial. We don’t have any 55+ communities in Sioux Falls but you might want to consider checking out The Meadows at Dakota Dunes and The Willows at Dakota Dunes, both about an hour’s drive away. Ocala provides an affordable lifestyle near several of Florida's biggest cities. 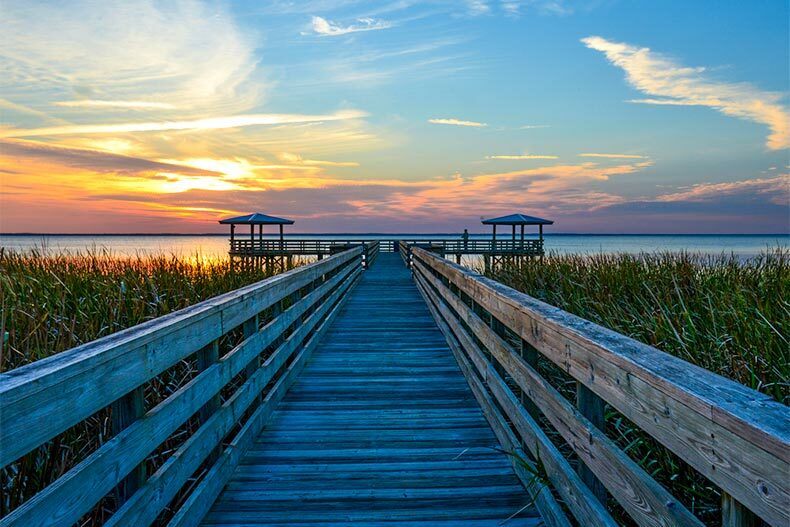 Many people think of Florida when they think about retirement and when it comes to the Sunshine State, you’d be hard-pressed to find a better spot for an affordable-but-entertaining retirement than Ocala. The cost of living is low, home prices are very reasonable, and there are so many options for affordable active adult living here. Couple that with the good weather and Florida’s very favorable tax laws and you’re going to find plenty of opportunities here for a healthy and enjoyable retirement. Your tradeoff is that you’re not close to the beach, but the city’s central location puts you within easy driving distance to lakes, beaches, and major cities. Nature is a big part of the appeal in Ocala. You can ride a glass-bottom boat, kayak, or canoe through Silver Springs State Park to see the manatees and sunken boats below. There’s also Ocala National Forest, which will require multiple trips to see all the splendor. And since Ocala is the self-proclaimed Horse Capital of the World, you’ll have to stop by some of the 1,200 thoroughbred horse farms in the area. 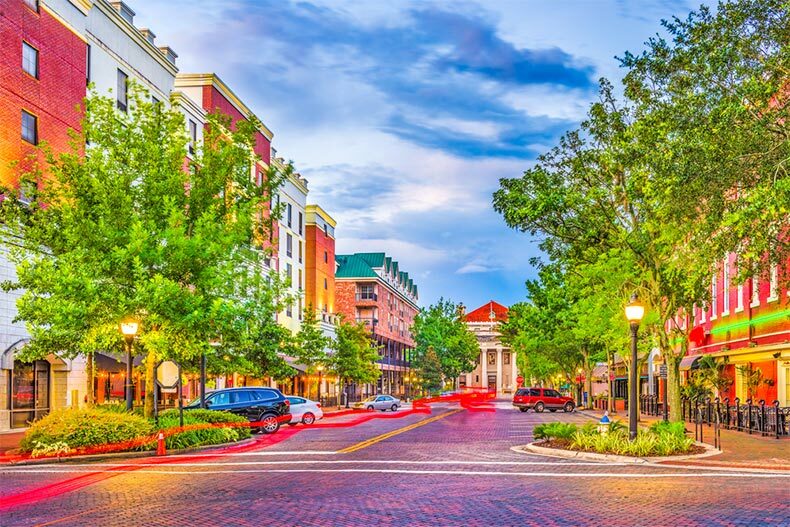 For when you want to step back into the city, head to Downtown Square where you can shop, eat and socialize in the many cafés, shops, and parks. The Appleton Museum of Art, or AMA to locals, showcases an impressive collection of paintings, sculptures, and artifacts to peruse and enjoy. Any discussion of Ocala active adult communities begins with On Top of the World, which came in at No. 2 on our 100 Most Popular Active Adult Communities for 2018 and No. 2 on the 55 Best 55+ Active Adult Communities for 2018. This community, which routinely offers homes in the $100K range, was described as an “adult Disney World” by one resident. However, don’t forget to also check out Oak Run, Summerglen, and Pine Run Estates for more affordable options. Lovers of Frank Lloyd Wright, baseball, and...lakes, will enjoy Lakeland, FL. For those looking for affordability in Florida who would prefer to be more centrally located to major cities, Lakeland provides that opportunity. Like Ocala, it offers a low cost of living, very reasonable home prices, and a wide range of active adult communities full of affordable homes. As the name suggests, you get to enjoy a retirement surrounded by plenty of water and outdoor opportunities. 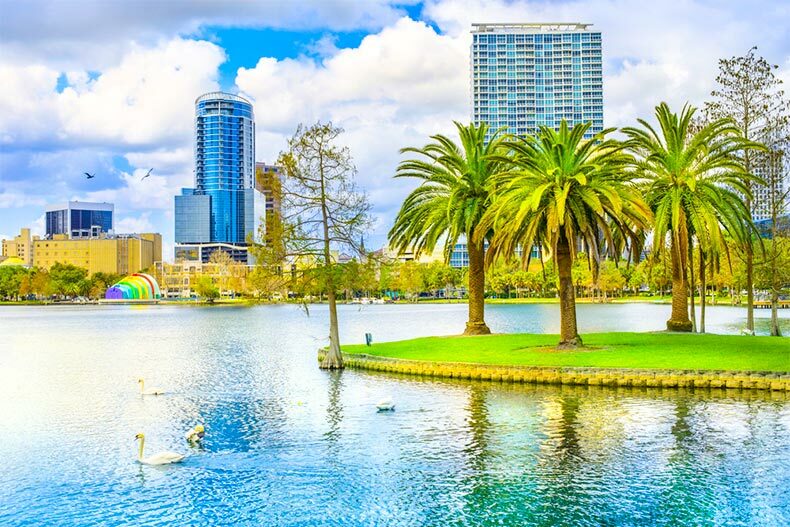 Lakeland is also situated right in between Tampa and Orlando, making it very easy to commute to either and enjoy all the attractions found in both. If you lived in Lakeland, you’d probably be at the park by now. The city boasts over 70 green spaces. Lakeland is perhaps best known for its local population of swans, which trace their heritage to a pair donated by Queen Elizabeth II in the 1950s. Lake Morton is a good place to see them, as well as wood storks, ibis, and geese. Downtown Lakeland is full of restaurants, shops, and coffee bars to enjoy. You don’t have to be a student to stop by Florida Southern College, which is home to the largest on-site collection of Frank Lloyd Wright architecture. Be sure to spend some time in Lake Mirror Park and follow its historic promenade and walkways to Hollis Garden, which is home to 10,000 flowers and indigenous plants. Buyers looking for affordable active adult living in the Lakeland area that still includes plenty of amenities should consider Cypress Lakes, Sandpiper Golf & Country Club, Highland Fairways, and Carillon Lakes. Each community offers homes either below $100K or in the $100s. Jacksonville has all that you'd expect out of a Florida retirement at a low cost and in less extreme weather. In thinking of places to retire in Florida, Jacksonville usually isn’t one of the first cities that gets name-checked. However, when you add up all of the factors, it’s actually the most affordable big city in the state for a fun and active retirement. The cost of living here is below the national average and a full 10 percent less than Miami. The city also scores well in terms of health care opportunities (Mayo Clinic, University of Florida Health, Ackerman Cancer Center), weather, and overall well-being. It’s also an ideal landing spot for active retirees as there’s everything from golf to sea sports to hiking to horseback riding available very easily. It’s hard to whittle down the list of all the things to do here. Head to Little Talbot Island to enjoy five miles of pristine shoreline and a maritime forest or make for Big Talbot Island for wetlands, marshes, bike paths, and secret beaches. The Jacksonville Zoo supports wildlife conservation right on the riverfront. Catty Shack Ranch rescues tigers and other big cats from captivity and gives you the chance to get up close with these beautiful creatures. 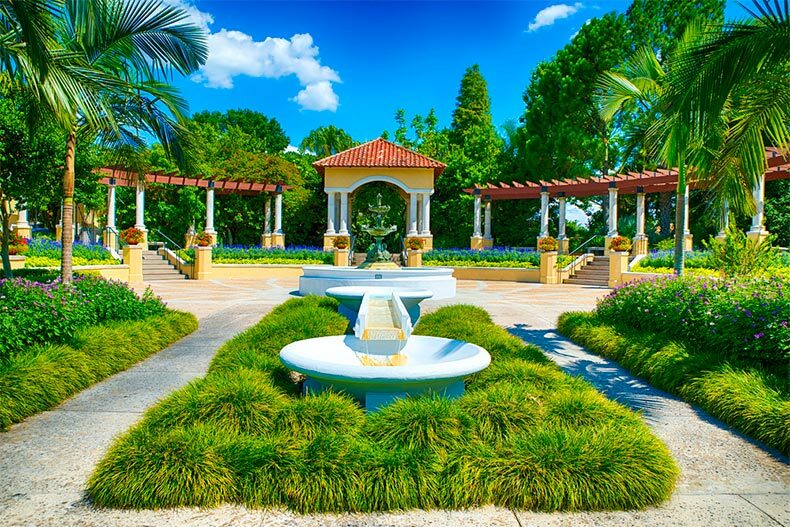 The Cummer Museum of Art and Gardens offers the chance to enjoy fine art and European-inspired gardens. The city is full of fun things to see and do as well, including the Riverside/Avondale district, Riverside Arts Market, and St. John’s Town Center. The Jacksonville area has quite a few active adult communities to consider, but some offer more affordability than others. Sweetwater offers condos, villas, and townhomes that start in the low $200s. Cascades at World Golf Village not only offers homes that start in the mid-$200s but is also home to the PGA Academy, World Golf Hall of Fame, and “Caddyshack" restaurant owned by Bill Murray. Freedom at Arbor Mill is a smaller 55+ community where homes start in the low $200s. Daytona Beach, FL is shedding its reputation and becoming a hotspot for retirement. 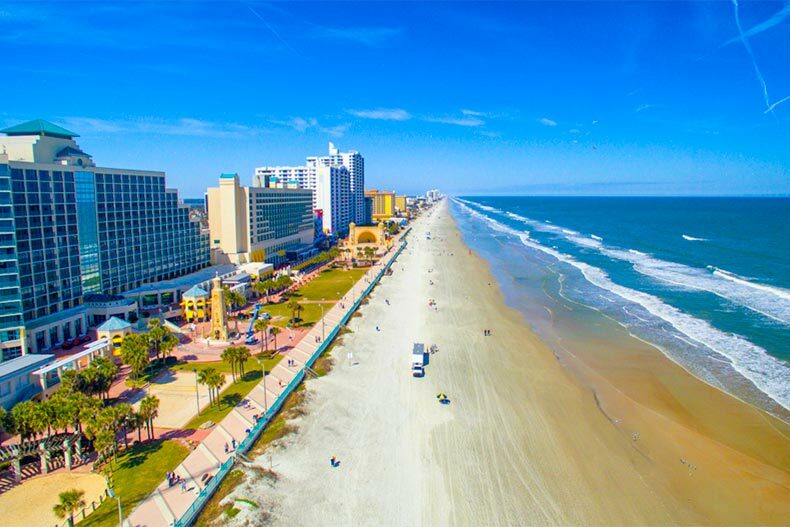 A lot of people think of college students partying on the sand when they think of Daytona Beach. However, this region has become a real retirement hot spot in recent years. There are obvious reasons like good weather and beautiful beaches, but there are also plenty of implications for those on a budget to consider. The region ranks high for affordable home prices, lower cost of living, good transit, and Florida’s favorable tax laws. There are also plenty of quality health care options available and an incoming influx of active adult and 55+ homes that will ensure this community continues to focus on the daily needs of that crowd. Daytona is the kind of place that always has something going on. Chances are it’s happening at Daytona International Speedway. However, it’s not all fast cars and speed in the region. There are plenty of sunny beaches, fishing holes, and golf courses such as Daytona Beach Golf Club and LPGA International. Shopping is a big deal in Daytona with Tanger Outlets and The Trails Shopping Center It’s also a region rich in culture and history, highlighted by the Washington Oaks State Gardens, the Deland Naval Air Station Museum, and Ormond Memorial Art Museum. 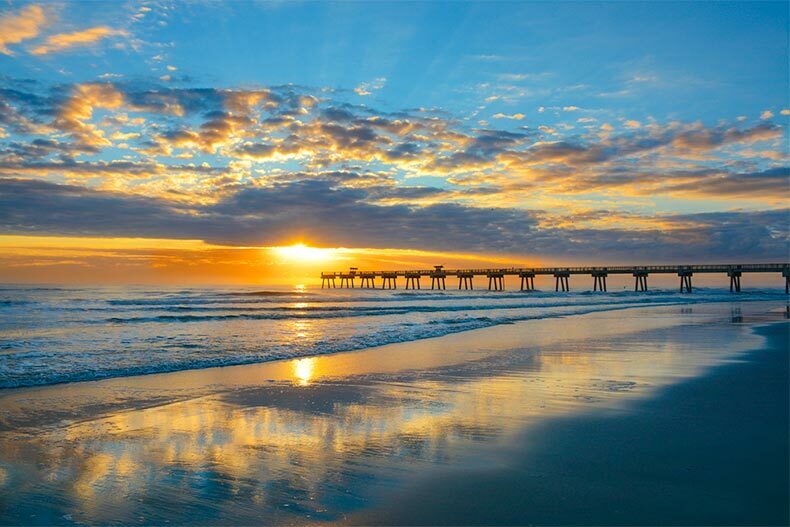 While Latitude Margaritaville might be the reason you’re considering Daytona Beach, those looking for more affordable options without losing the amenities might be found in nearby Ormond Beach. Plantation Bay Golf & Country Club is an all-ages gated community that offers memberships at three different levels and homes starting in high $100s. Meanwhile, Halifax Plantation is a golf community that features a spacious clubhouse, resort-style amenities, and homes in the high $100s. Retirement in Gainesville, FL means being surrounded by great health care, sporting events, and plenty of fun. Another Florida city better known for college students, Gainesville has gained a reputation over the years as the college town that retirees love to call home. The cultural and entertainment opportunities that university life brings to the equation couple well with the affordability of housing and low cost of living here, creating an ideal atmosphere for retirees who want to have options without spending too much. Having the University of Florida here also means retirees have access to some of the most highly rated health care specialists in the state. The city also offers a high number of health specialists per capita, so active adults don’t have to travel far for good care. As you might imagine, Gainesville offers plenty of outdoor opportunities for retirees. The city boasts over 30 miles of biking and hiking trails and seven Florida State Parks. You can canoe or paddleboard one of the many waterways or simply float down the spring-fed river at Ichetucknee Springs State Park. Along with everything the University of Florida has to offer in terms of arts and entertainment, residents get to enjoy the Florida Museum of Natural History, Harn Museum of Art, the Hippodrome State Theatre, and Curtis M. Phillips Center for the Performing Arts. Downtown Gainesville has plenty to offer as well, from the shops and boutiques at Union Street Station to Wednesday’s Union Street Farmer’s Market at Bo Diddley Plaza. "For retirees, the benefits of Gainesville are more than just the weather and central location. The University of Florida is the soul of Gainesville, but with it comes many of the benefits of a much larger city, but without the traffic. Located on campus, Shands Hospital is one of the top medical institutions in the country and in the past few years has expanded their facilities with a new cancer hospital, a new heart and vascular hospital, and a new neuromedicine hospital. North Florida Regional Medical Center is also located in town with a number of facilities including an ER. And there is a large VA Hospital located right next to Shands for retired veterans. While we don’t have any active adult communities on our site in Gainesville, the city is 45 minutes from Ocala, where there are plenty of affordable active adult communities to consider. A low cost of living, friendly taxes, and a scenic riverfront are just a few of the things New Castle County offers retirees. Delaware is a state often cited for its tax-friendliness for retirees. It doesn’t tax Social Security benefits, has no sales tax, and offers one of the lowest property tax rates in the nation. New Castle County takes it up to the next level in terms of providing an affordable retirement option for those looking for the best of all worlds in the Northeast. When the idea of heading South doesn't fit and you're not interested in the fancy bells and whistles, this region can make an ideal retirement spot. The county's low cost of living, affordable homes, and the public transit system make it easy to get settled and get around. This Delaware region also boasts a rich history as well as cultural and recreational attractions for locals to enjoy. Situated along the Delaware River, living here puts you within 45 minutes of Philadelphia and three hours from New York City and Washington D.C. And when traveling farther is needed, both Summit Airport and New Castle Airport are close. New Castle has a great lineup of performing arts venues such as The Playhouse, the longest-operating theater in the country and The Grand Opera House, which showcases over 100 shows each season. 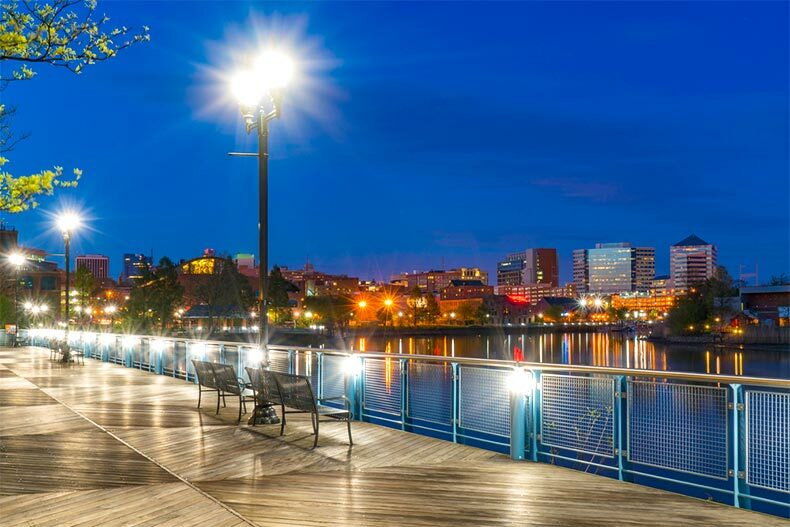 Riverfront Wilmington offers a slew of entertainment options, including museums, theaters, restaurants, river cruises, a trampoline park, and Frawley Stadium. The county offers more than 500 acres of scenic parklands, which include the Brandywine Zoo. The historic legacy of the DuPont family continues with spots such as Nemours Mansion and Gardens, Hagley Museum & Library, and nearby Longwood Gardens. Golfers of all levels will appreciate living near Frog Hollow Golf Club, Rock Manor Golf Club, and DuPont Country Club. Buyers looking for an affordable option in the county can consider The Village of Hershey Run, a smaller age-restricted community where homes start in the low $200s. Outside of Wilmington, Crossings at Christiana in the town of Bear has homes starting in the high $100s. Village of Red Lion Creek in Bear and Spring Arbor in Middletown both offers active adult living starting in the low $200s as well. South Bend, IN has a tranquil vibe with access to everything provided by the University of Notre Dame. It might be best known as the home of the University of Notre Dame but you don’t have to be Rudy to fall in love with South Bend. Indiana’s fourth-largest city by population offers an extremely low entry point on housing and equally low cost of living (the lowest of any city on our list). It also helps that Indiana does not tax Social Security and property taxes are very low. 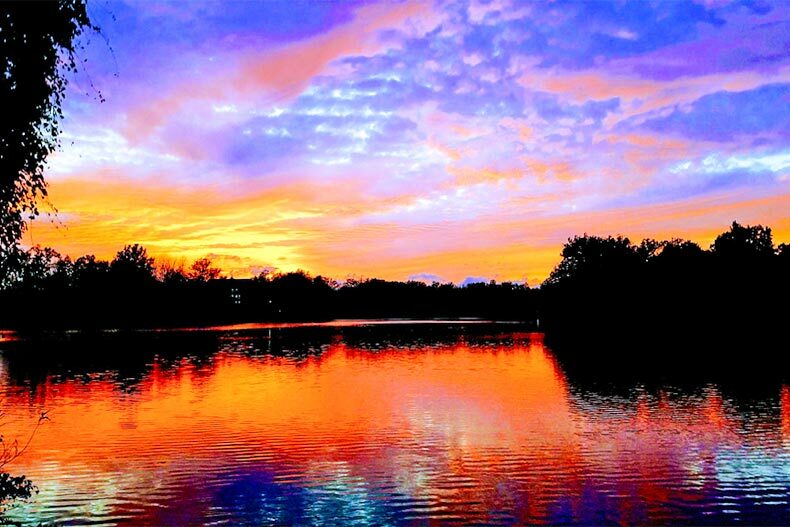 Those who are looking to retire affordably in a small town that still offers plenty of culture and recreation will want to consider South Bend, especially if they’re hoping to experience all four seasons. It goes without saying that Notre Dame football games are around here, but sports fans will be delighted to know that plenty other men’s and women’s programs at the school are worth checking out, including basketball, soccer, and lacrosse. There’s more to South Bend than sports, however. The Studebaker National Museum is home to a classic collection of cars while the South Bend Museum of Art includes historical and contemporary art across five galleries. The Morris Performing Arts Center is a historic 2,500-seat venue that hosts various concerts and events. Potawatomi Zoo is Indiana’s oldest animal park while St. Patrick's County Park offers wooded trails and plenty of riverfront activities. Those looking for an active adult lifestyle will want to venture out of South Bend and head east 15 minutes to Mishawaka. Here, Stonebridge Villas at Edison Lakes is an active lifestyle community with homes starting in the mid $200s. Also, consider The Villas at Reverewood, a new 18-home community where homes start in the low $200s. Whether you prefer the beach, entertainment, or shopping and dining, Tampa has it. The Tampa area actually topped our list of the Best Places to Retire overall in 2018, so we weren’t too surprised to see it rank well once more. There are obvious reasons to retire here, including the gorgeous beaches overlooking the Gulf of Mexico and warm weather that doesn’t reach the scalding-hot degrees of South Florida. However, it’s also a good landing spot for budget-minded retirees as well. The cost of living is a little higher than the national average, but that’s offset by a strong local economy, a very tax-friendly environment, a healthy transit system, and good overall well-being scores. Tampa isn’t just a beach city. It’s also full of cultural significance, such as the Tampa Museum of Art, the Henry B. Plant Museum, and the Straz Center for the Performing Arts. Westshore Plaza, Hyde Park Village, and Ellenton Premium Outlets are just some of the shopping destinations to be found in the region. Golfers will appreciate the many courses and options available, from TPC Tampa Bay to Saddlebrook to Westchase Golf Club. The Tampa Electric's Manatee Viewing Center isn’t just for tourists. And, of course, the Tampa Riverwalk is a very pedestrian-friendly place for all kinds of activities and events. There are over 40 active adult communities found in the Tampa Area, so you’ll have plenty of options. If you’re looking to keep things budget-friendly without sacrificing the fun of living in one of these communities, Tampa is a good place to start. There's plenty of culture and affordable homes to go around in Waco, TX. Most people think first about Dallas, Houston, Austin, or San Antonio when they consider retirement in Texas. But those with a budget in mind might want to consider what Waco has to offer. 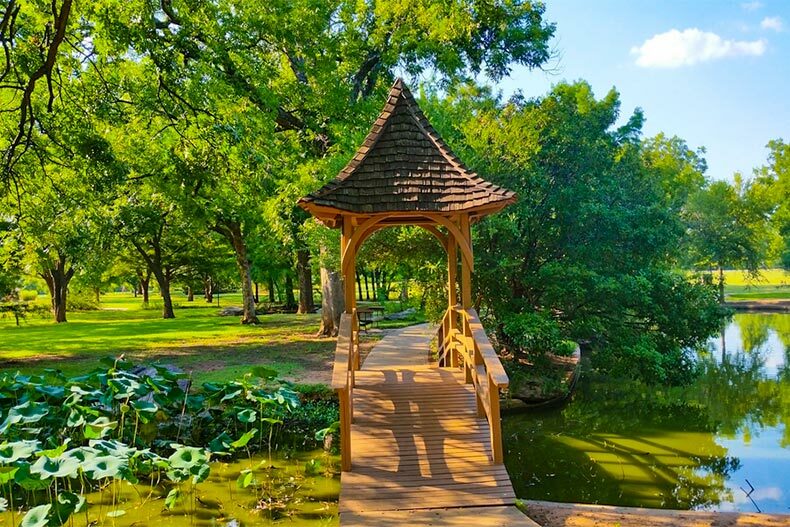 Located midway between Dallas and Austin, this Central Texas city boasts an extremely low cost of living coupled with reasonable home prices, favorable taxes, good weather, and a strong collection of attractions and things to do. 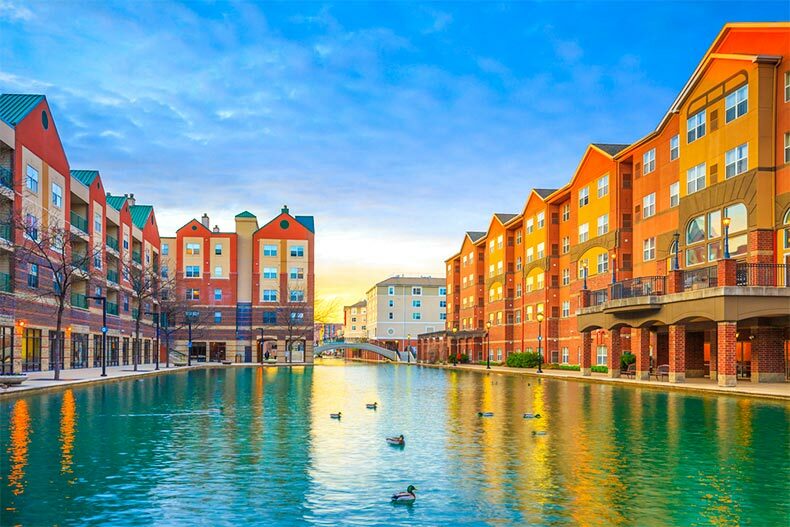 Baylor University gives it a college town vibe to keep things vibrant but there’s plenty for active adults to do as well. Waco boasts a strong collection of historic and artistic centers to explore, including Mayborn Museum, Texas Ranger Museum, and Waco Mammoth National Monument. There’s also a Dr. Pepper Museum that celebrates the soft drink made popular here. Fans of Chip and Joanna Gaines will be aware of Magnolia Market at the Silos, their center for eating, shopping, and activities. Some other great local spots to have fun include the Waco Hippodrome, Spice Village and Cameron Park Zoo. 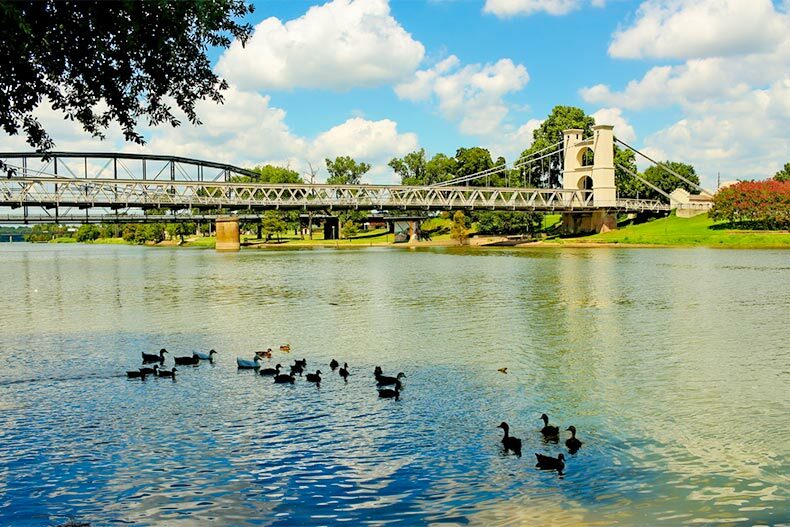 While we don’t have any active adult communities listed in Waco, those interested in Central Texas living can look to Georgetown, which is about an hour south, or Mansfield, which is a little over an hour north. 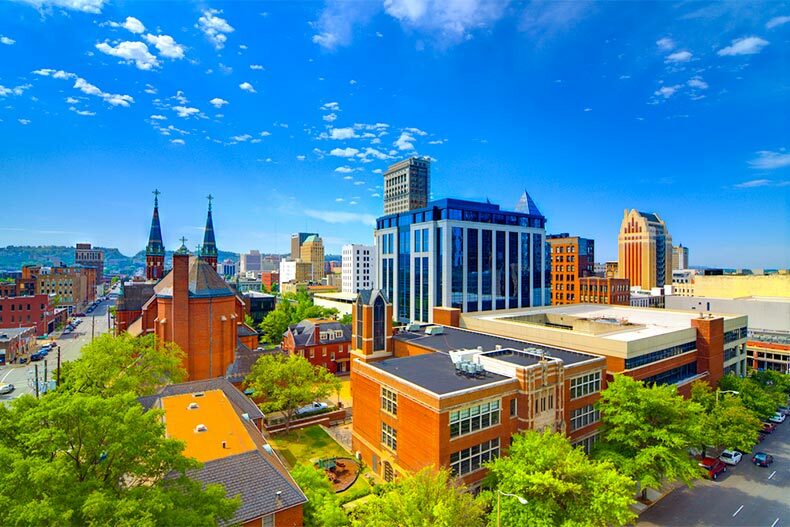 Birmingham, AL thrives with history, culture, and nice weather. Birmingham, Alabama’s biggest city, is also one of the biggest secrets when it comes to finding an affordable retirement without sacrificing quality of life. But the secret is getting out as more people discover the amazing value they can find. The cost of living here, especially when it comes to groceries, transportation, and health care, is much lower than metropolitan areas of the same size. Home prices here are also very low. Plus, there’s also no tax on Social Security benefits, the weather is pretty nice, and the health care options are solid. There are many great museums to visit, including the Birmingham Museum of Art and the Birmingham Civil Rights Institute. There are also plenty of performing arts experiences, such as the Alabama Ballet and Alabama Symphony Orchestra. Birmingham is also a city of festivals, such as The Sidewalk Moving Picture Festival and Taste of 4th Avenue Jazz Festival. Sports fans will enjoy being able to attend Birmingham Barons baseball games as well as UAB Blazers football & basketball games. Cornerstones at Oxmoor Valley is an active lifestyle community where home prices start in the low $200s. English Turn at Greystone Farms is a highly sought-after active lifestyle community in the city that has home prices starting in the mid $200s while The Cottages at Danberry is also worth checking out and has homes starting in the mid $200s. Memphis made its reputation on music and barbecue but it’s also gaining a reputation as a solid pick for retirement, especially if you want to balance affordability with access to fun. The region offers a very affordable base of homes to choose from and the cost of living is way below the national average. You won’t see any state taxes on Social Security or retirement account income and the property taxes are fairly low as well. Retirees also get a place to call home with seasonal weather, a decent well-being score, and a region with a strong sense of service and volunteerism. Memphis has so many museums and places of historical significance, it’s hard to keep track. You can start with the National Civil Rights Museum, the Stax Museum of American Soul Music, the Memphis Rock 'N Soul Museum, and the Brooks Museum of Art to get a feel for the soul of the city. Of course, you can’t live here and not stop by Graceland at least once. You’ll also want to make stops at the Memphis Zoo and Mud Island Park to stay connected to nature. 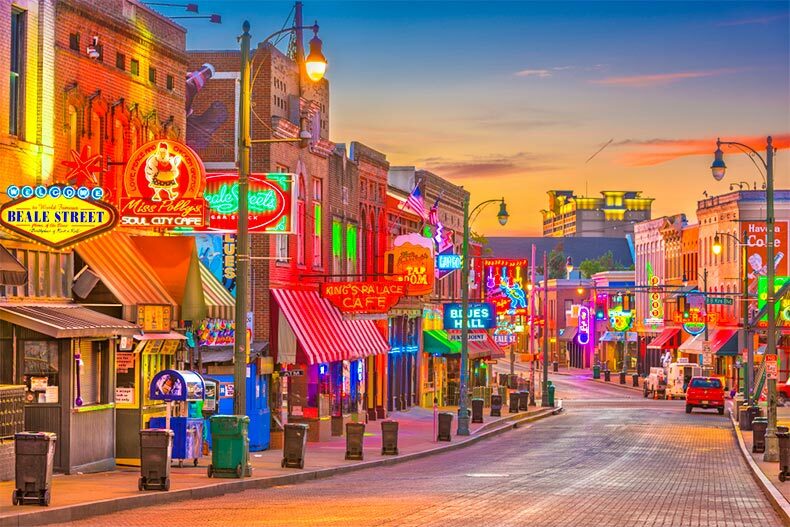 And of course, you’ll want to get to know Beale Street, the home of the Blues and perhaps one of America’s most iconic streets. Those looking to balance affordable active adult living will want to start their search at Sterling Place in Lakeland, a 120-home community with prices starting in the $100s. Next, check out The Oaks at Woodchase in Cordova, where homes start in the mid $100s. Finally, take a visit to The Village at Schilling Farms, a 55+ community in Collierville with homes starting in the low $200s. 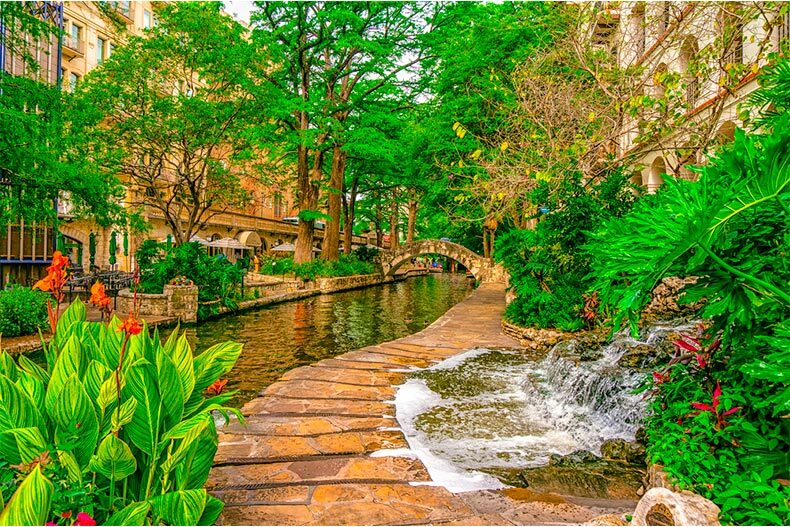 San Antonio's River Walk is always a fun option, but this affordable city has plenty more to see. It might surprise some to learn that San Antonio offers a cost of living below the national average and a decent income-to-home price ratio. There’s no state income tax, so Social Security and retirement income are all tax-free (though Texas does have high sales taxes and property taxes to consider). However, the good weather, solid public transit system, and overall well-being of residents all bring this Texas city up a notch as well. Well, you’re not going to come to San Antonio and not visit The Alamo, of course. Afterward, there’s no better way to explore the city’s shops, museums, hotels, and restaurants than by using The River Walk. The Pearl District has become the city’s cultural hub amongst historic buildings and unique shops. The region is home to all kinds of museums and art centers, including the San Antonio Art League Museum, the Public Theater of San Antonio, and the Guadalupe Cultural Arts Center. There are six municipal golf courses and driving ranges through the city as well as great courses such as TPC San Antonio and The Quarry Golf Club. Scenic Hills, a quaint 55+ community located in Schertz, offers homes that start in the mid $100s in a community that still includes plenty of amenities. Hill Country Retreat is the big 55+ community in the region (2,000+ homes) but has homes that start in the low $200s. There’s also The Orchards at Valley Ranch, an 88-home community full of amenities with homes starting in the mid $200s. 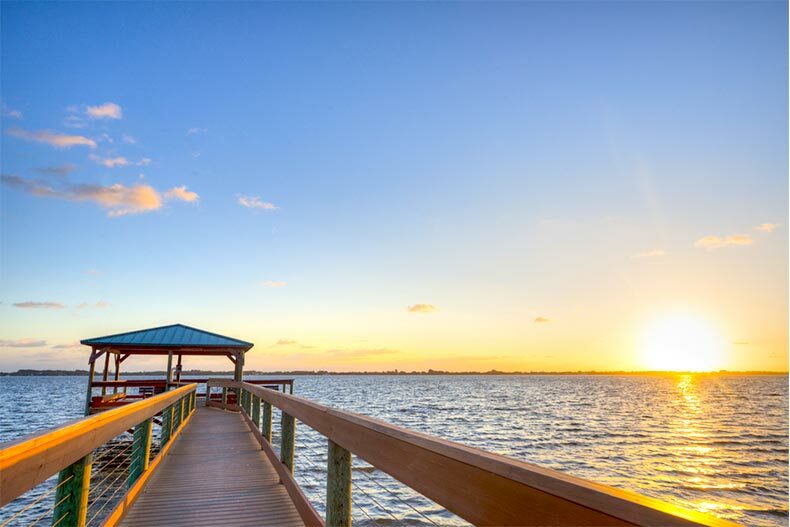 Both Fort Myers and Cape Coral, FL offer an affordable, Oceanside retirement. 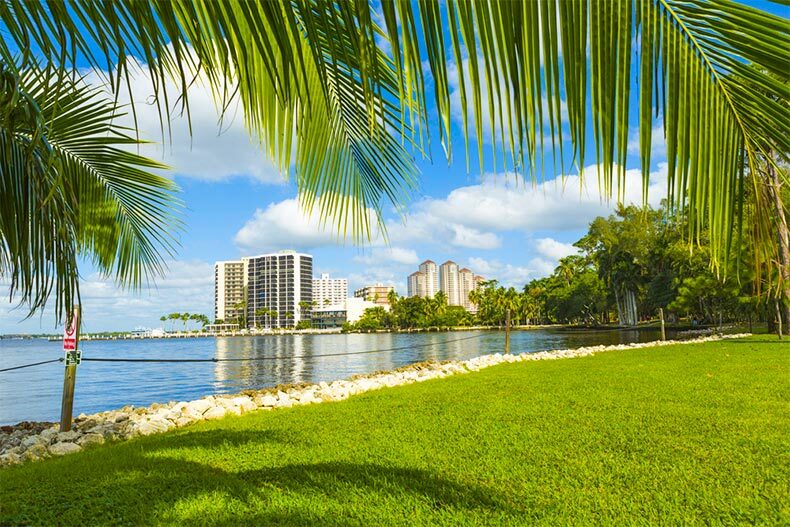 The Fort Myers-Cape Coral area, found along Florida’s southwest coast, is known for its fishing, beaches, golfing, shopping, and just about any other recreational activity, one imagines from a Sunshine State retirement. Relative to many of the other popular retirement locations, it’s also fairly affordable. The cost of living is higher than the national average but that’s offset by Florida's friendly tax laws for retirees. The region also boasts a comfortable year-round climate and strong quality of life. The Edison and Ford Winter Estates in Fort Myers offer a glimpse of what it was like to be affluent in the early and middle parts of the 20th century. Baseball fans should make for JetBlue Park to see the Boston Red Sox or Hammond Stadium to see the Minnesota Twins each spring. Lakes Park is a great place to explore and is part of the Great Florida Birding Trail. Sanibel Island is a must-visit, especially to experience the J.N. "Ding" Darling National Wildlife Refuge. And of course, you have to go to Manatee Park to see the gentle giants swimming. Golfers will appreciate The Cape Royal Golf Club and The Eagle Ridge Golf Club. One of the great things about this region is that it has so many quality active adult communities that offer buyers the chance to get in at very low prices. Communities that offer homes for under $100K include Fiddlesticks Country Club, Seven Lakes, and Pine Ridge at Fort Myers. There are also quite a few communities with homes starting in the $100s, including Cinnamon Cove, Heritage Palms, Magnolia Landing, and Gulf Harbour Yacht & Country Club. Retirees have long been heading to Phoenix, AZ. Despite this, it's still very affordable. The Phoenix area has been a popular retirement destination for years. Considering it's one of the sunniest places in the U.S. and offers a climate perfect for those dealing with arthritis, it’s no surprise. What might surprise is that even as the metropolitan area grows, it remains a very affordable place for retirees to live. Cost of living can be on the higher side in some areas, but living in an active adult community can often offset that. Social Security benefits are not taxed and retirement savings are eligible for tax deductions. Phoenix is also one of the best places to live for quality health care and offers a decent public transit system to help get people where they need to be. Downtown Phoenix has really blossomed in recent years. Head to Roosevelt Row for art galleries, music shops, and much more. The Melrose District along Seventh Avenue is a haven for antiques, art, and great restaurants. Cactus League Spring Training arrives every year in February and March, bringing the Milwaukee Brewers to their Brewers Fields facility. Art-lovers won’t want to miss the Phoenix Art Museum, which is the largest of its kind in the Southwest. 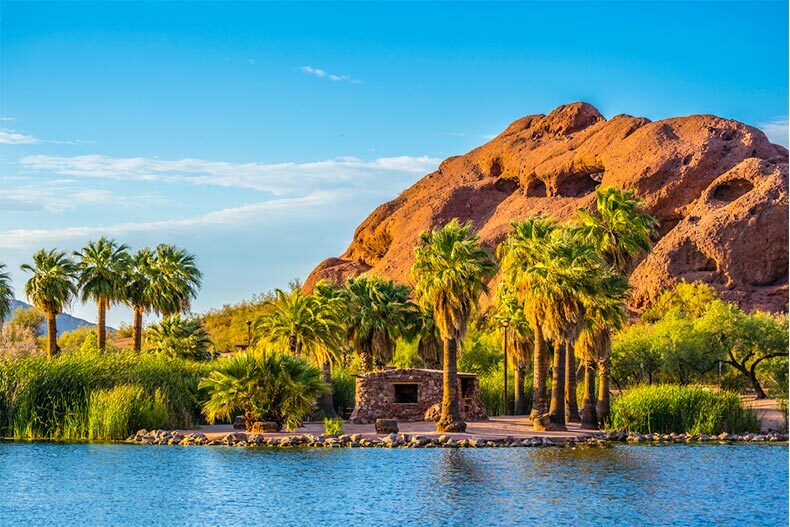 The Phoenix Zoo puts you up close with plenty of animals while the Desert Botanical Garden really is something to behold. There are so many active adult communities to consider in the region. But if you’re looking for affordability, look to Sun City, Sun City West, Leisure World, and Sunbird for starters. There are actually 36 communities that start below $200K, so you might just want to run down the whole list here. Melbourne, FL is near beaches, light on traffic, and very affordable. Located on Florida’s Space Coast, Melbourne is another Sunshine State retirement spot where the cost of living is lower but the number of opportunities available remains high. Home prices are very reasonable here (though it’s considered a hot market by many) and the tax-friendly state makes it even more inviting. The beaches here really stand out, as do the many natural habitats found here. Those looking for warm weather, plenty of recreation, and an affordable lifestyle will likely find what they’re looking for in Melbourne. Melbourne is on Florida’s Space Coast, which means it’s very close to Cape Canaveral Air Force Station where you can watch rockets launch. Head to the Kennedy Space Center Visitor Complex to watch and explore the region’s history. 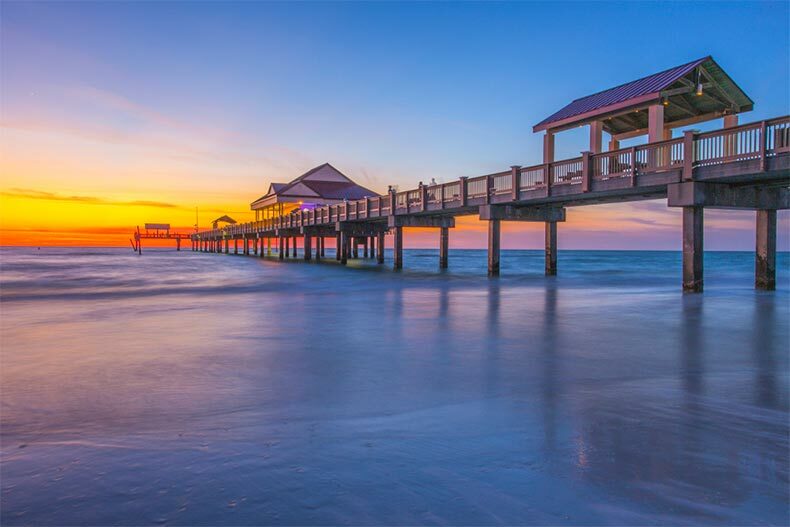 Westgate Cocoa Beach Pier is a historical landmark and home to restaurants, bars, gift shops, and entertainment. There’s also plenty more to see and do in Downtown Melbourne. Brevard Zoo is a great place to take the grandkids while Sebastian Inlet State Park is a great way to get into nature. Those looking to live here affordably might want to start their search at Indian River Country Club, where they have numerous amenities and homes that start in the $100s. There’s also Alamanda Key and Pine Creek, both of which have homes starting in the high $100s. Some folks might not have considered Michigan for their retirement but once they see what’s possible in Grand Rapids they often rethink that. 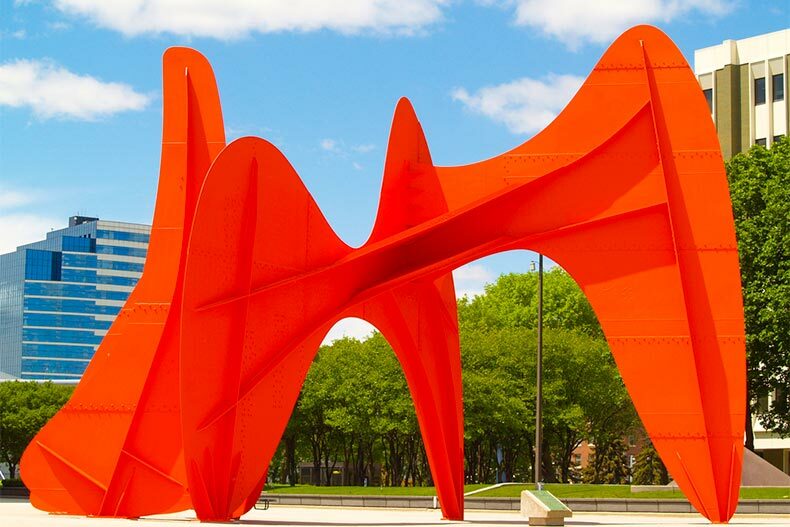 Alexander Calder's abstract sculpture La Grande Vitesse is now the centerpiece of Calder Plaza, where the city hosts hundreds of festivals each year. The Grand Rapids Public Museum can be found along the Grand River. And you wouldn’t want to miss Frederik Meijer Gardens & Sculpture Park, a 158-acre botanical garden and outdoor sculpture park full of stunning displays and exhibits. Other popular places to visit are the Gerald R. Ford Presidential Library, the Grand Rapids Art Museum, and the Urban Institute for Contemporary Art. And beer lovers will likely recognize Founders Brewing, one of the many craft brewers and beer bars located here. Those looking for a budget-friendly active adult lifestyle should consider Avalon Pointe, an active lifestyle community in Caledonia that features both new construction and resale homes. There’s also The Reserve of Coopersville, an active lifestyle community just outside the city. Both communities have home prices that start in the mid $200s. Disney and tourists might be the first things you think of when you think of the Orlando-Kissimmee area, but there are plenty of good reasons to consider retirement in the region as well. The cost of living is on the higher side but that’s offset by low taxes, a very strong local job market, a high well-being score, and a robust public transportation system. Plus, there’s just so much to do here that living here really puts the active in active adult. It goes without saying that living in Orlando means close proximity to some of the top amusement parks in the world, including Disney World, Universal Studios, and SeaWorld. The city has plenty to offer in the cultural and artistic realm as well, including Orlando Ballet, Orlando Shakespeare Theater, The Charles Hosmer Morse Museum of American Art, and Orlando Museum of Art. Downtown Orlando is full of shops, restaurants, and entertainment all its own. Within city limits, budget-minded buyers should consider VillageWalk at Lake Nona, with homes located on the water via a network of canals. Homes here start in the $200s. Outside of Orlando, those looking for affordability should look to High Vista at Ridgewood Lakes and Solivita. Both offer homes starting in the $100s, though each offers a distinct lifestyle experience depending on what you’re looking for in retirement. Wichita Falls, TX is home to a lot of green space and affordable homes. When it comes to finding an affordable place to live in Texas, all signs seem to point to Wichita Falls. Located midway between Dallas-Fort Worth and Oklahoma City, this North Texas city has often been cited among the best places to live affordably in the country. That goes for retirees as well, they’ll find very attractive housing prices, a low cost of living, and very strong health care availability. The region also boasts a comfortable year-round climate and the robust local economy, which all add up for a great place for retirees. The most unique attraction in Wichita Falls has to be the Professional Wrestling Hall of Fame and Museum. Nearby, the Newby-McMahon Building origins might be shady but "the world's littlest skyscraper” has come to be one of the town’s landmarks. Lucy Park, which is set along the Wichita River, features a man-made waterfall and plenty of migrating birds. The River Bend Nature Center brings guests back to the outdoors with nature trails and exhibits. The city also boasts a wide range of museums and art centers, such as The Kemp Center for the Arts, the Museum of North Texas History, and Juanita Harvey Art Gallery. We don’t have any active adult communities in Wichita Falls. We do have 27 communities to consider in the Dallas-Fort Worth area. We also have 12 communities in the Oklahoma City area, which is actually slightly closer. Indianapolis, IN provides the fun of a big city with plenty of green space and a low cost of living. Those who want to retire in a city without paying city prices should race on over to Indianapolis. The biggest factors working in its favor are very affordable home prices and an extremely low cost of living compared to many other major cities of the same size. Indiana exempts Social Security from state income tax and the state's average property tax rate is 0.87 percent. Retirees can also look forward to good overall health care and access to local specialists. Of course, you can’t go here and not visit Indianapolis Motor Speedway, whether it’s during the Indianapolis 500 or just to see The Yard of Bricks. You can take a walk through White River State Park or walk amongst the animals at the Indianapolis Zoo. History lovers will enjoy the Indiana State Museum and Eiteljorg Museum of American Indians and Western Art. Football fans will find a second home at Lucas Oil Stadium where the Colts play on Sundays. And there always seems to be something going on in Downtown Indy. Those looking for affordable active adult living in the region will find plenty of options to choose from. If you want to live in the city, consider checking out Stone Bridge and Village at New Bethel, both of which have prices starting in the $100s. Just outside of the city, look to Vandalia by Del Webb, Stoney Meadows, and Wellington at Saratoga, all of which have homes starting in the $100s as well. To create 55places.com’s Most Affordable Places to Retire in 2019 rankings, we identified every major metropolitan area across the 50 U.S. states with a population of at least 50,000. We eliminated certain cities based on crime, median household income data, and extreme climate considerations, leaving us with 215 places. We then collected twelve different data points to narrow the list down. We considered data on each places’ median income, average home sale price, cost of living, tax friendliness to retirees, job creation performance, active adult communities, well-being ranking, state health care options, local health care options, local climate, public transit score, and volunteering rates. Job Growth: Based on the Milken Institute’s 2017 report on best-performing cities for job creation and sustainability. Local Health Care Ranking: Based on Healthgrades’ 2018 National Health Index data. Transit Score: Based on the most current AllTransitTM Performance Score of each city. Volunteering Rate: Based on Corporation for National and Community Service’s City Rankings by Volunteer Rate.